The pink gid was never released. The last official run were the painted and unpainted gid. Totally surprised that svhc would retire the sculpt. A heartening tale, indeed. Congrats on landing my favorite version of the lauded beastie. Did he travel from the UK to be with you, sir? Thank you, David! He's one of the crown jewels of my collection, no doubt. He hopped a plane from Cali. I've never sought out the 2 headed Bemons because of the crazy prices but that is one gorgeous figure - the color combination is perfect. where did you find those mini GID Bemon's? is it SVHC ? They’re resin minis, self produced I believe by fun9us. 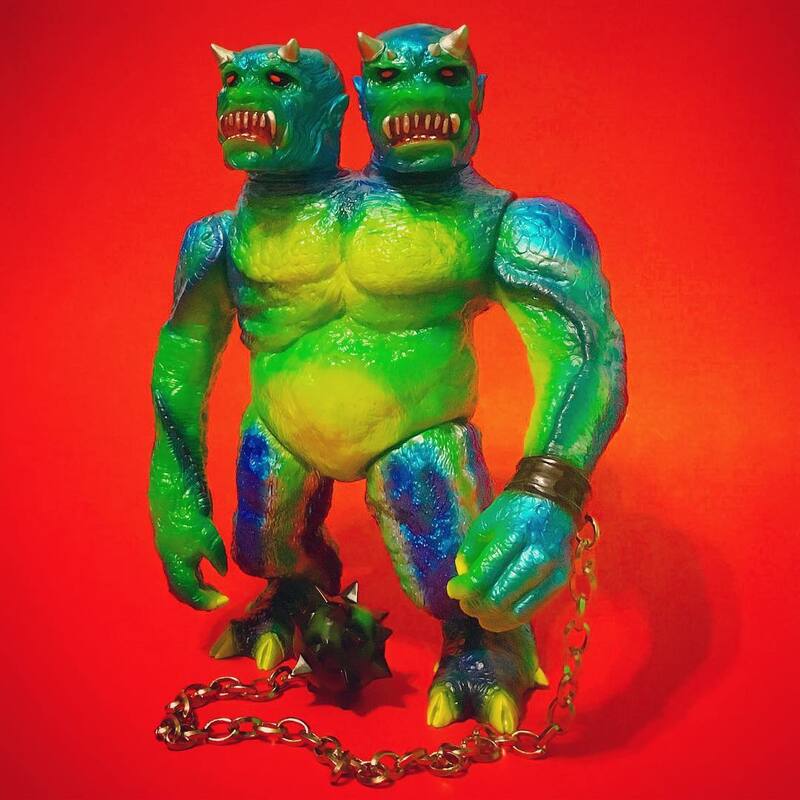 I think the resin minis were done by Monster Island NYC, Paul on the boards here but I can’t remember his SB handle. I’ll double check with Ian. Please do, I would love to get my mitts on one of those mini resins. A link would be great since my google search of Fun9us and Monster Island NYC came up with nothing to do with the tiny 2 headeds. wow are these yours!? Are they all GIDs? I got to find one. or two. or three. really love that duo colored red and blue. only the green one glows. But there are a few other glow ones floating around in the world, I'm sure. Well I heard that Fun9us is no longer around, so I don't know how i would have a chance to get one. I did manage to get a small Galligantus glow guy. Ill see if I can post an image later, I dont think I have enough posted comments to have that privelage. Plus not sure how posting images is done on this page. I’m still around – just been a miserable hermit the last few years! wingnut0, phantomfauna and patrickvaz like this. Hey thank you for the heads up! Glad you are still around. Hoping to hear from somebody here who wants to sell one to me. melter skelter, phantomfauna, xSuicide Squadx and 1 other person like this. That red and black is a certain type of classic evil that will never, ever get old to me. here is a clearer picture, the header is stamped 10/30, same number as my yellow header card... Odd coincidence. Also notice the Galligantus card has the same exact pose of heads as the BEMON header card. Why doesn't the Galligantus command as much money as the Bemon 2 headed Giant? Because its newer? Please excuse the number of photos on this message, just really excited about getting him. Both Bemon and Galligantus header card art are modeled after Ron Cobb’s Famous Monsters cover art. The Galligantus version is just revisioned artistically. As far as the Galli not commanding the same price, I think it’s because of Bemon’s longevity sofubi lore behind his toys. It was the “original” two headed beast, very limited, extremely difficult to get, Honda’s inherently mysterious nature. ISH is the polar opposite of all those things, most notably having Galligantus being meant for the masses. ISH is producing in mass? The Galligantus version I obtained is all sold out on Mandarake etc... The others I do see are commanding almost 500 bucks depending on the color base. Someone told me the Bemon 2 headed Giant sculpt is more desirable because it was done by hand where as the ISH sculpt was done by one of those 3D imager process thingy. Either way, I LOVE my Bemon, and I also love the Gally Guy. Blopus did a real nice exclusive version of him, if you don't mind, I am posting images on this Bemon Giant thread. @JungleGeorge First and foremost, the Galligantus was *absolutely* hand sculpted, masterfully, by Jetturre. Whoever told you that is doin’ that man a disservice. But the 2HBemon was also definitely hand sculpted, as well. Also by an extremely talented artist in Japan. As far as mass producing, I didn’t mean to imply insane numbers, but the GID and pea soup green blanks were open pre - order, and the painted runs exceeded 30 I believe. melter skelter, JungleGeorge, zindabad and 1 other person like this. In my book you're winning if your hand-sculpting can be both clean enough to pass for digital and dirty enough to produce some of the freaks Jetture puts out but yeah, credit where it's due. Rich and MoonspellxRites like this. Saw this somewhere on the internet!!! I MUST HAVE ONE. anybody got info on this? I had my friend spray this GID up for me. He did such an excellent job, had to show it off. There is a dedicated Galligantus thread, it can be found here. Bummer, was excited to open the thread and find a cool bemon shot. I'm sure Justin's toy has its own thread. Please post this there. melter skelter and badteethcomics like this.